The famous manufactory Ulysse Nardin has opened its first boutique in Paris, on the prestigious street Rue François, parallel to Champs Elysees. The boutique is decorated in a maritime theme with porthole windows and wooden floors. The boutique will feature fine watches of Ulysse Nardin, along with exclusive collections, including Blue Toro, Freak Platine, Sonata Boutique and Blue Executive Dual Time. CEO of Ulysse Nardin, Patrick Hoffman, said: "Paris - a symbol of fashion and luxury, one of the most visited cities in the world. And our new boutique is the part of our strategy to make watches available to customers all over the world." Official site of Ulysse Nardin. Famous watchmaker Ulysse Nardin at the international watch exhibition BaselWord 2014, to be held at the end of next month in Basel (Switzerland), will officially unveil a new limited edition model Perpetual Manufacture. Swiss watch brand Ulysse Nardin has announced the release of a new model Dual Time Manufacture, presented in two versions: stainless steel and 18 - carat pink gold. The famous watchmaker Ulysse Nardin, in honor of the Year of Horse by the Chinese calendar, has released a special limited edition model Classico Horse (Ref. 8156 -111 -CHEV_V5). The new model Royal Ruby Tourbillon (Ref. 799-88) by the watch manufacture Ulysse Nardin is a true masterpiece of watchmaking. A precious ruby, which gives its owner the wisdom and invulnerability, was used for the manufacture of fine watch. The Genghis Kahn Westminster Carillon Tourbillon Jaquemarts Minute Repeater watch by Ulysse Nardin with its design differs from all models. This is an exclusive watch, having all the advantages of classic mechanical watches. The company Ulysse Nardin announces the release of a new watch Perpetual Manufacture, which is compatible with a perpetual calendar and second time zone. In the heart of the Olympic Winter Games - Sochi, the legendary watchmaker Ulysse Nardin opens doors of the third boutique in the Russian Federation. 11 years ago Shai Schneider, the Chairman of Ulysse Nardin and wife of the late Rolf Schneider, in the past - the president and CEO of the watch company, has proposed a mechanism for women`s watches. This is a caliber, with which is equipped a new amazing new model Jade. The watchmaker Ulysse Nardin for the 120th anniversary of GUM has prepared a gift. We are talking about the novelty Classico 120 Limited Edition. The famous watchmaker Ulysse Nardin has expanded its Freak collection with a novelty Freak Cruiser, which is a floating anchor in the form of an oscillating bridge on the dial. Watchmaker Ulysse Nardin has released a new unique model Circus Minute Repeater, the dial of which is a circus. The watchmaker Ulysse Nardin presents the Schooner Chronograph watch, issued in honor of the famous American schooner "America ", which won the first British club "Hundred Guineas " (America`s Cup). The novelty Schooner by the famous watch manufacture Ulysse Nardin has released in honor of the American schooner in 1851. That was the year of the first international regatta in Cowes, timed in time for the World Industrial Exposition. Today, the watch market presents a wide range of variety of unique models with a perpetual calendar. Such models have appeared long ago. The famous watchmaker Ulysse Nardin for the fifth consecutive year is the official partner and sponsor of the Monaco Yacht Show. In honor of this event was released a novelty Monaco Limited Edition (Ref. 1183-126LE-3/63_MON). The legendary watchmaker Ulysse Nardin has expanded its collection with a new limited edition model Freak Phantom. Swiss watch brand Ulysse Nardin has announced the release of a new jewelry model Royal Ruby Tourbillon. The design of the presented novelty Royal Ruby Tourbillon is characterized with a bezel, studded by 60 round diamonds. July 10 this year, a collection of Ulysse Nardin complicated watches was presented in an old mansion Raff House. The main event of the evening was the presentation of a new minute repeater - a delightful watch Oil Pump. The famous watchmaker Ulysse Nardin announces the release of a new collection Jade, including the gorgeous and elegant women’s watches. July 3 this year, the representation of the anniversary program, which is devoted to the 120th anniversary of the department store, was held in GUM. The famous watchmaker Ulysse Nardin has recently announced the opening of the first mono-brand boutique brands at Quay Quai des Bergues, Geneva, Switzerland. The legendary watchmaker Ulysse Nardin has released a limited edition watch Voyage Bleu Chronograph. The main feature of the new model - the use of blue vulcanized rubber, from which the dial, sides of the case, bezel and buttons are made. The "Moscow Nights" classical music festival 5th season 5 opened In June 15, in Nicolino. The famous watch company Ulysse Nardin sponsored the outdoor festival. The famous watchmaker Ulysse Nardin has released a new version of the watch Maxi Marine Diver. A distinctive feature of the new items is new elements, presented in the design of a dial and a bracelet. Especially for a charity auction Only Watch 2013, the Swiss watch brand Ulysse Nardin has released a unique novelty Marine Chronometer Manufacture. The novelty Skeleton Tourbillon by the watch brand Ulysse Nardin, which is represented at the international exhibition BaselWorld 2013, is the first model with a manufacturing skeletonized movement. Watchmaker Ulysse Nardin has unveiled a novelty Pride of Baltimore Limited Edition, named after the famous American caper’s ship whacked against the ships of Great Britain in the early nineteenth century. The famous Swiss watchmaker Ulysse Nardin has added to its collection with a new version of the model Black Sea (Ref. 263-92-3C/923). The modern watch market presents a rich assortment of watches with enamel dials. This is an exquisite centuries-old art form, which is used in the watch industry for many years. The famous watchmaker Ulysse Nardin has recently announced which came into force in March 1, 2013 the appointment of Benedict Schlegel as a delegate of the Board of Directors. New music watch Stranger from the famous watchmaker Ulysse Nardin is constructed on the basis of a music box. Venice has always been a source of inspiration, and it is difficult to resist the beauty of this magical city, including the watchmakers’ of the Swiss company Ulysse Nardin, who managed to convey its romanticism and elegance in a limited collection Minute Repeater Venice. The famous watchmaker Ulysse Nardin has released its futuristic model, called Sonata.The model with its design reminiscent of the rapid yachts. The new Sonata watch is available in two versions - in a case of titanium and ceramics or in a case of 18-carat rose gold. Swiss watchmaker Ulysse Nardin has announced its sponsorship of the fourth annual yacht show in Monaco - Monaco Yacht Show. Models of the renowned Swiss watchmaker Ulysse Nardin are always distinguished by their peerless design execution. Every watch of the manufactory are a work of art, a real masterpiece. 2012 – it is the year of bicentennial anniversary of the heroic deeds committed by the Russian people in the war against Napoleon. Jubilee touched also the watch world: the company Ulysse Nardin presents its novelty - a collection of watches dedicated to World War in 1812. The legendary Swiss watchmaker Ulysse Nardin presents a new Classico Luna collection. Models, included in this line, are equipped with a moon phase indicator. New Classico Limited Edition Santa Maria Watch by Ulysse Nardin, dedicated to the ship "Santa Maria"
Swiss watchmaker Ulysse Nardin, which for over 160 years has been producing non-standard models of perfect quality, has introduced a new model - Classico Limited Edition Santa Maria. Swiss watchmaker Ulysse Nardin, which has always surprised its fans with unrivaled models of watches, continues to delight its new products. At the world exhibition BaselWorld 2012 the company has introduced its new Blue Sea (Ref. 263-97LE-3C). Swiss watchmaker Ulysse Nardin at the world annual exhibition BaselWorld 2012 has presented its delightful Sonata Streamline watch. The model is presented in two versions: with a titanium case (diameter of 44 mm) in combination with 18-carat gold and ceramic bezel (Ref. 675-00), and with a titanium case in combination with 18-carat rose gold (Ref. 675-01). Collection of this year from the Swiss company Ulysse Nardin has expanded by a watch model Marine Chronometer Manufacture in the massive case and the black hands, evoke memories of the iconic retro and antique cuckoo watch. Due to its self-winding mechanism manufactory, modified with functions of the perpetual calendar and second time zone, the new chronograph Blue Toro by Ulysse Nardin is another masterpiece of fine watchmaking. The most fabulous holiday of the year is approaching closer and closer with every hour closer - a change of years. And perhaps the main protagonist of this event, as always, will be a watch, leading the countdown of the latest seconds in the year. The watch company Ulysse Nardin has released a limited edition exclusive model of 250 items for its mono-brand boutiques. This is Maxi Marine Diver Boutique Ref. 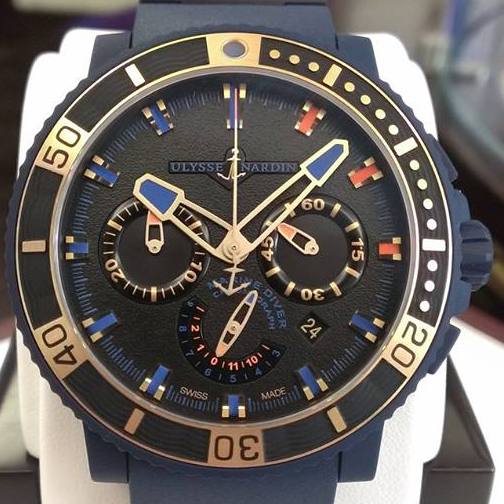 263-95LE, which can be bought in one of the 12 mono-brand stores Ulysse Nardin. On Wednesday, the legendary Swiss watchmaker Ulysse Nardin has arranged dinner party in Moscow, dedicated to the anniversary of the opening of its mono-brand boutique in Moscow. An International Exhibition of Showboats International Rendezvous, which is held annually on the initiative of Prince Albert II, Monaco Yacht Club and the Builders Association of super yachts, is considered one of the most prestigious and elegant events, which involved representatives of the world's elite - the owners of the world's best ships.